A view of Bob Petersen’s gun room. Cased sets were located in the drawers below the main display counter. Click here to learn more about gun history in the free download, Ten for All Time. 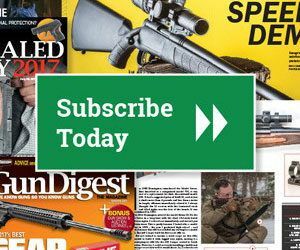 It includes information on the Cabanas P-21, Remington Model 673, VZ-52 Czech, Lee-Enfield Jungle Carbine, French Service Revolvers, S&W Model 1940, Model 66 Super Single and more. Editor’s Note: This article on the National Firearms Museum is an excerpt from Gun Digest 2013. The NRA’s National Firearms Museum, established in 1935, proudly boasts a collection of nearly 6,000 firearms and twice that number of accoutrements and related items. The overwhelming majority of the National Firearms Museum’s holdings have come from the more than generous contributions of members, friends, and industry. Recently, a gift from the estate of Robert E. Petersen, of Los Angeles, to the National Firearms Museum set a record in philanthropy to the National Rifle Association (NRA), with a nearly $20 million gift, the largest in the 140-year history of the NRA. The National Firearms Museum’s Robert E. Petersen Gallery is 2,000 square feet and contains 425 of the finest American and European firearms. Through the generosity of Mr. Petersen’s widow, Margie Petersen, 425 firearms from his lifelong collection of historic, rare, and extraordinary sporting arms were given to the National Firearms Museum, with the only requirement being that anything gifted to the museum must be displayed. The National Firearms Museum staff proudly opened its newest exhibit, The Robert E. Petersen Gallery, to the general public on October 8, 2010. The opening marked the culmination of Petersen’s dream of sharing his extraordinary collection of firearms with the world. The collection is on permanent display at the National Firearms Museum, where it will be preserved for the education and enjoyment of future generations. Husband, father, veteran, publisher, restaurateur, outdoorsman, automobile enthusiast, philanthropist, and friend are all words that partially describe Robert E. Petersen. Born in 1926, in Barstow, California, he proudly served in the U.S. Army Air Corps during World War II. Following his service in the war, he started a hobbyist magazine for car racing enthusiasts titled Hot Rod. From that initial venture he built the Petersen Publishing empire that included 39 monthly periodicals by the time he sold the company, in 1996. Petersen published a number of iconic American magazines including Hot Rod, Guns & Ammo, Sports Afield, Petersen’s Hunting, and Motor Trend, just to name a few. He hunted on nearly every continent and was credited with being the first person to ever take a polar bear with a .44 Magnum handgun. (Both the revolver and the bear are on exhibit in the National Firearms Museum.) He also served as Commissioner of Shooting Sports for the XXIII Olympiad, held in 1984, in Los Angeles. This Colt Model 1883 Gatling Gun is marked “U.S. Navy” and is thought to be the only surviving example complete with its original naval deck mount. Pete, as he was called by his friends and his wife, Margie (1936- 2011), first established a relationship with the NRA’s National Firearms Museum in the early 1990s, when they loaned a substantial part of his antique Colt’s collection for display. Since that time, the National Firearms Museum has always been fortunate to exhibit priceless treasures from Pete’s personal collection. • Largest collection of fine double rifles on display to the public. • Exceptional collection of high-end double barrel shotguns. • Largest Gatling gun collection on public display (10 Gatlings). • Guns owned and used by noted individuals such as Annie Oakley, John Olin, Robert Stack, Julian Hatcher, John F. Kennedy, Hermann Goering, and Elmer Keith. While the collection is broad and varied, if there is a pervasive theme, it is that of the finest sporting arms in the world, including those by gun makers such as Beretta, Boss, Holland & Holland, Purdey, Fabbri, Galazan, Westley Richards, Parker, Browning, and Rizzini. “The Empire Gun” by Holland & Holland is a 28-gauge Holland Royal, featuring gold inlay by Allan M. Brown. It is thought to be the most exquisite Holland & Holland in the Petersen collection. Of special inclusion in the Petersen gift are the world-renowned Parker Invincibles—considered by many to be the finest and most valuable set of American-made guns in existence—a “baby” Paterson revolver, and the Grover Cleveland 8-gauge Colt’s double-barrel shotgun. The Parkers and the Colt 8-gauge have been on loan to the museum since 2001. Philip Schreier is the senior curator at the National Firearms Museum.